The Inlet BMW Park's connecting channel sheet pile, Tanjung Priok, North Jakarta are repaired. It is targeted to be completed this week.
" 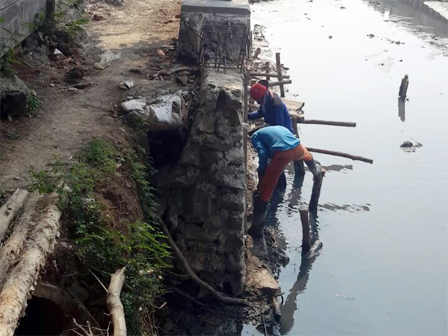 Repair itself is done on the left and right of the damaged sheet pile"
North Jakarta Water Resources Sub-dept. Head, Santo said, the repair takes 300 meters length. It will be realized through self-managed funds. "Repair itself is done on the left and right of the damaged sheet pile," he stated, Wednesday (11/8). According to him, materials used for sheet pile is river rocks. Later on, the top of the sheet pile will be fitted with a concrete seat belt with a thickness of about 60 centimeters in order to avoid prolonged damage. "In this sheet pile, a lot of river rocks are dislodged. Surely it will cause collapse someday," he uttered. Then for the channel itself has 8-10 meters. Water flow in the channel will empty into Cincin Reservoir located on east side of BMW Park, Papanggo Urban Village, Tanjung Priok.